Popular Electronics' master quizmaster Robert P. Balin created this "Electronic Measurements Quiz" to test your ability to match the indicated component with one of the commonly associated parameter units. For instance, if a carbon resistor was illustrated, you would choose, if offered as an option, the temperature coefficient of resistance unit of ppm/°C. I erroneously swapped the units for item A and item H (80% score). Oh well, there goes the cumulative quiz GPA. Maybe you will do better. 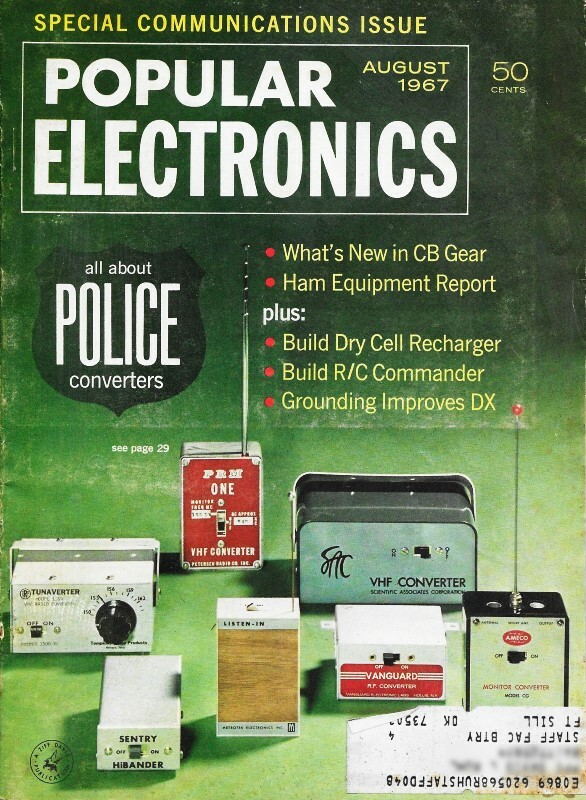 There was another Electronic Measurement Quiz in the January 1963 Popular Electronics. Commonly used electronic devices are described by one or more specialized units of measurement which define dimensions, quantities or rate of drift, temperature, voltage, current, impedance, sensitivity, compliance, and other characteristics. For example, a lamp may be rated in lumens per watt (lm/W). 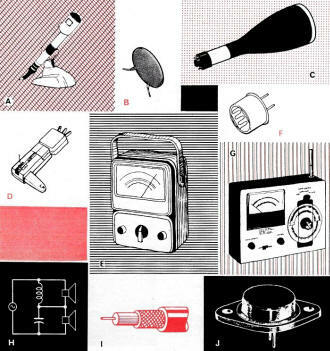 Test your ability to match the measurement designators (1-10) with the illustrations (A-J) below. Electronic circuits perform functions similar to many mechanical devices and natural phenomena, and finding an analogy between them often leads to a better understanding of both. 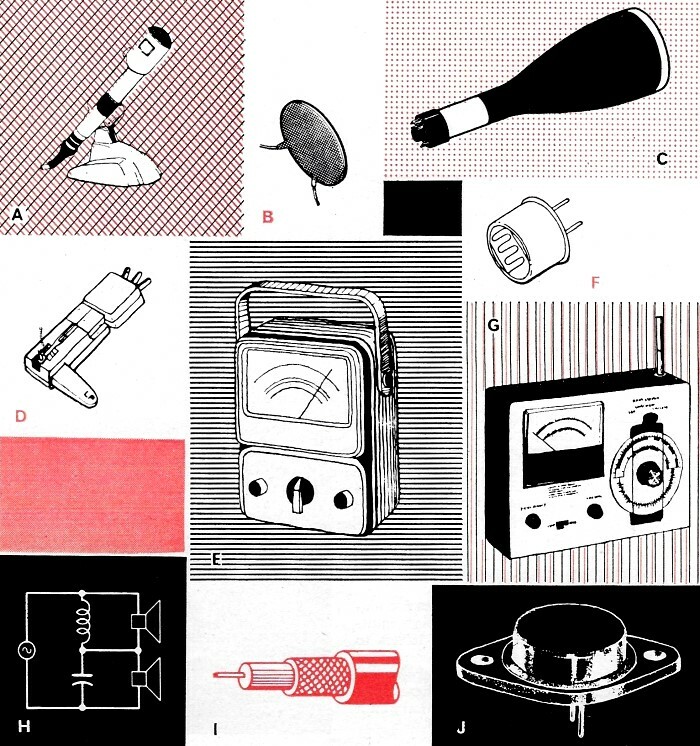 See if you can match the numbered electronic circuits on the left with the lettered sketches on the right. 1 - J Thermal resistance in a power transistor is expressed in degrees centigrade per watt (°C/W). 2 - D Phonograph cartridge compliance is expressed in centimeters per dyne (cm/dyn). 3 - H Slope of crossover network's frequency response curve (for speakers) is expressed in decibels per octave (dB/octave). 4 - A Microphone sensitivity is expressed in negative decibels (-dB) where 0 dB is equal to 1 V/dyn/cm2. 5 - F A photocell's sensitivity to light is expressed in microamperes per foot-candle (μA/fc). 6 - I Capacitance of coaxial cable is measured in picofarads per foot (pF/ft). 7 - G R.f. signal strength is measured in microvolts per meter (μV/m). 8 - C Deflection sensitivity of a cathode-ray tube is often given in volts per inch (V/in). 9 - E Input impedance of multimeters is expressed in ohms per volt (ohms/V). 10 - B Temperature coefficient of ceramic capacitors is determined in parts per million per degree centigrade (p.p.m./°C).